Smoke Grey Jackets There are 9 products. The smoke grey uniforms for waiters/waitresses proposed in this section represent a modern alternative to the classic black colour, dedicated to those who prefer a new, refined and elegant colour for their staff. Made of Gabardine Plus, a strong wrinkle free polyester fabric, that doesn’t fade neither shrink while washing, this uniforms for restaurant include Roma Jacket, for men, or Pavia Spencer, short model for women. Both of them have a shawl collar and only one button. A valid alternative to jackets, still trendy today, is represented by vests, proposed in two models: Zurigo Vest, specific for women, and Parigi Vest, a more classic model. Those who prefer the comfort and practicality of aprons can choose between the two following proposals: Luino Apron, a long model recommended for men, and Alassio Apron, shorter, V-necked model ideal for women. In the end, the nice accessories indispensable to complete with style the uniforms of waiters/waitresses and barmen/barwomen: the narrow tie model Seventy, the women’s short tie model Nodino and the classic Bow Tie. Men's jacket with shawl collar, model Roma one silver colour button, unlined Smoke Grey colourImmediately available for delivery: sizes from 46 to 56Made of Gabardine Plus, 100% Pol. Short Women's spencer jacket, model PaviaUnlined, one silver colour buttonSmoke Grey colourImmediately available for delivery: sizes from 42 to 48Made of Gabardine Plus, 100% Pol. 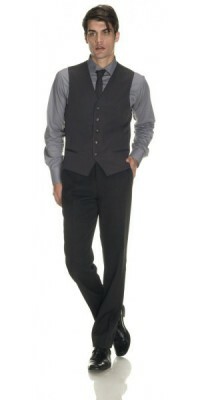 Unisex vest with 5 buttons, model ParigiLined, back made of the same fabric Smoke Grey colourImmediately available for delivery: sizes from S to XL Made of Gabardine Plus, 100% Pol. Women's vest with 5 buttons, model Zurigo Lined, back made of the same fabric Smoke Grey colourImmediately available for delivery: sizes from S to XL Made of Gabardine Plus, 100% Pol. 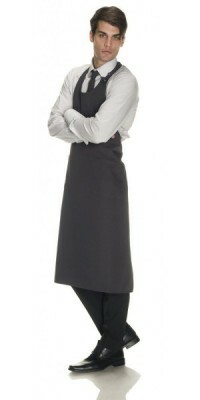 Long apron with bib, unisex, model Luino two pockets appliedSmoke Grey colourAdjustable one sizeMade of Gabardine Plus, 100% Pol. Short apron with bib, model Alassio two pockets applied - unisex Smoke Grey colourAdjustable one sizeMade of Gabardine Plus, 100% Pol. 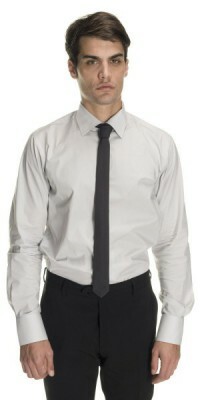 Narrow tie, model Seventy, unisexSmoke Grey colourone sizeMade of Gabardine Plus, 100% Pol. Short tie model Nodinowith the knot already doneSmoke Grey colouradjustable one sizeMade of Gabardine Plus, 100% Pol.